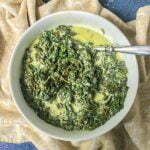 If you are looking for an easy low carb side dish, try this slow cooker greens Alfredo. Just a few ingredients to make this rich and creamy Alfredo sauce with a healthy dose of power greens. Only 4g net carbs per serving. Turn on the slow cooker to high. Add the cream cheese, cream and Parmesan. Whisk well as it melts. Then add in garlic, salt and pepper. Put all of the greens and cover with lid. Cook for about 1/2 hour and stir. Put lid back on and cook for another 1/2 hour until the greens and cooked well or to your liking. Serve as a side dish or use to stuff chicken, or with pasta or rice.